That’s the promise Naked Pizza makes: they’re naked…and you’re gonna feel good. ”Naked”, in this case, refers to a pizza stripped of processed ingredients. Pizza is one of those foods I’d never miss if it suddenly disappeared. In New York City, I’m singularly unimpressed by the thick, doughy, overly cheesy, greasy orange glop that often passes for “pizza”— a gateway to indigestion, bloating and gas for the gluttonous. And, yes, I know there are designer pizzerias…but—fancy or not—pizza is usually a calorie-loaded cheese, processed meat and starch-carb fest. Naked Pizza started as an entrepreneurial venture in post-Katrina (2006) New Orleans. Co-founders Randy Crochet and Jeff Leach shared a passion for healthy eating; it was of particular concern to Leach, whose diabetic daughter also served as an inspiration for the business. 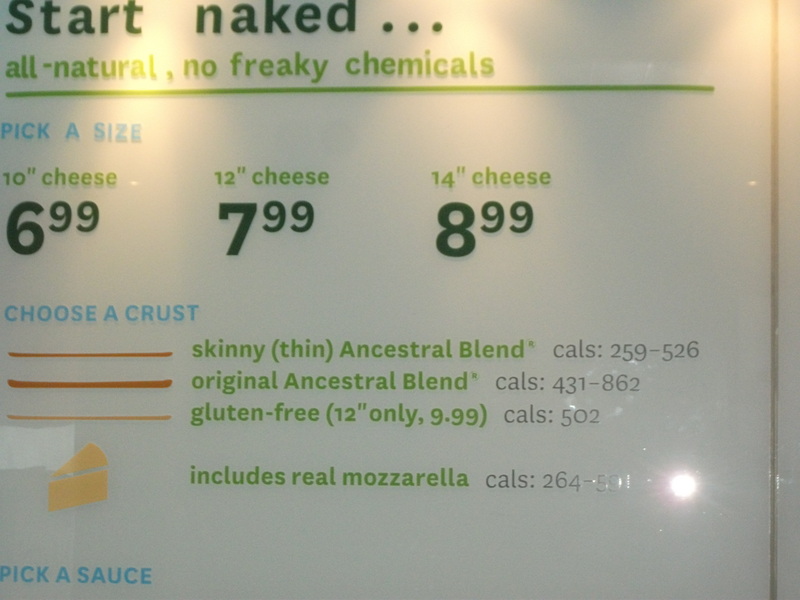 Could Naked Pizza, now a franchised pizza chain, still deliver on its health-driven claim? Would it taste good? Curiosity piqued, I headed to the new Midtown East site of NYC’s first and only (so far) Naked Pizza to find out. 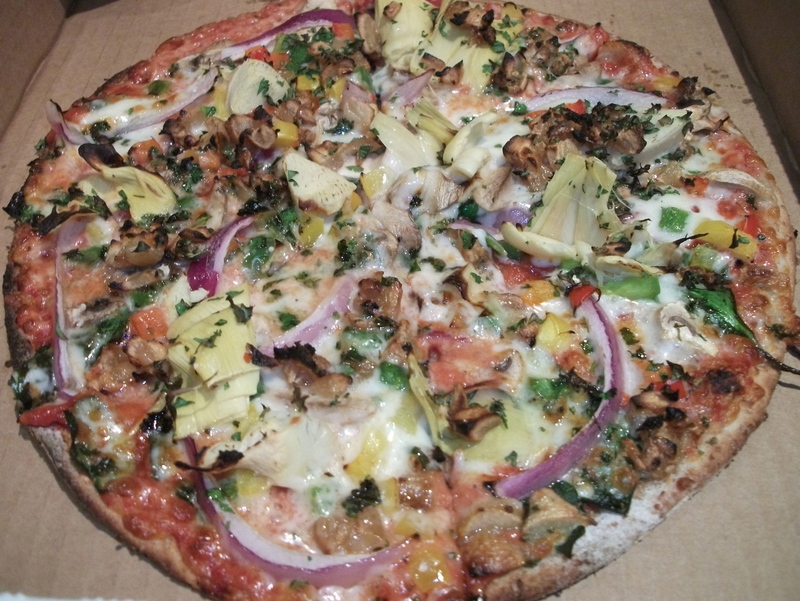 Naked Pizza’s mantra is: “no added sugar, no ‘freaky’ chemicals—nothing artificial”. The crust is a proprietary trademarked “Ancestral Blend” of 10-grains (oats, brown rice, buckwheat, quinoa, amaranth, teff, spelt, tapioca and two kinds of wheat), plus prebiotic agave fiber and probiotics. The Manhattan outpost is a compact space—bright, spare and lime-green. I pondered the larger-than-life menu to decide what size pie, type of crust (skinny, original or gluten-free), and toppings I wanted. The staff was enthusiastic and good-natured: they willingly answered all my questions. According to Ace Brown, a friendly staffer, my choice—the “Superbiotic”, a vegetable medley topping of artichokes, spinach, bell pepper, mushroom, garlic, onion and cilantro, is the runaway bestseller. Not surprisingly, the “Smokehouse” (hickory-smoked bbq sauce, onion and chicken) and Ragin’ Cajun (sausage, chicken, garlic, bell pepper and onion) were the next most popular sellers—NYC is a meat-obsessed town, after all. “Pizza??! !” my husband asked, his mouth agape, when I opened my box for the big reveal. ♥ A whole grain crust that was tasty, thin and slightly (not overly) crisp, with a hint of nuttiness. ♥ The generous portion of artichoke hearts amid a toothsome vegetable medley. ♥ Its garlicky kick—from fresh garlic (not garlic powder), I was told. ♥ Its clean, fresh taste—no greasy residue or salty mouthfeel….thank you! ♥ A judicious use of skim milk mozzarella in the topping. ♥ Its additive-free tomato sauce, a tasty combination of tomato paste, water and house seasoning blend. No high fructose corn syrup. No added sugar. ♥ The calorie count: just 572 calories for a 10-inch pie…divided by 2; that’s 286 calories per person. Just two easily remedied quibbles: there was too little spinach (a mere smidge of spinach graced our pie) and no discernible cilantro flavor (if it was there, we didn’t taste it). Bottom line: we give a thumbs-up for getting Naked…. as a tasty, healthy, fast food option. This entry was posted in Food, Health, Healthy Take-Out, New York City and tagged all-natural pizza, gluten-free pizza, Healthy fast food, Jeff Leach, multigrain pizza crust, Naked Pizza NYC, New Orleans. Bookmark the permalink.